The Canadian Council of Churches is the largest ecumenical body in Canada. It’s church members represent 25 churches of Anglican; Evangelical; Free Church; Eastern Orthodox and Oriental Orthodox; Protestant; and Catholic traditions. Together, CCC church members represent 85% of the Christians in Canada. The Canadian Council of Churches was founded in 1944. Last November of 2012, ACC Canada had been accepted as one of it’s member churches. We are the 25th CCC Member. 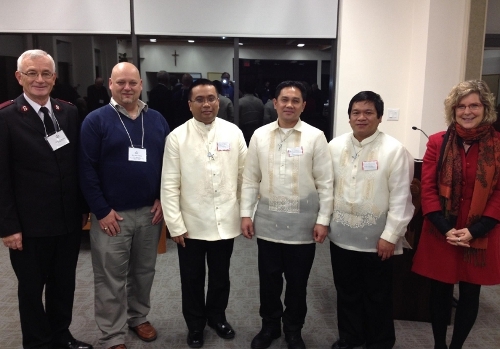 From left to right: CCC President Jim Champ (far left), CCC Past President Bruce Adema, Archbishop Adolfo, Msgr. John Philip, Father John Benjamin, and CCC General Secretary Karen Hamilton. This is a great opportunity for us to extend our outreach to Christian brethren’s here in Canada, as well as share our visions, thoughts and prayers among the members for the greater glory of the Holy Spirit. Here is the URL link to ACC Canada’s representation on CCC events and activities. Visit CCC site – to learn more about the CCC visions, programs and initiatives.